Easybook is created to simplify your travel plans which usually start with the ticket booking. To ease the hassle, we create a platform for you to book your preferred bus ticket online through our website or mobile app. Gone are the days when you brave the traffic to stand in line just to buy a ticket. With Easybook at the palm of your hand, you can do it wherever and whenever is convenient to you. 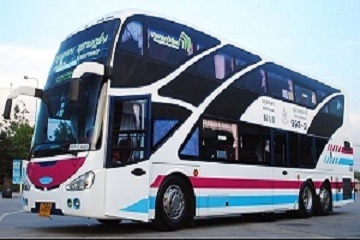 This is especially handy when you are in bustling countries like Thailand, which is why you can find numerous bus companies available to take you from city to city. One of them is Bangkok Bus Line. As a well-known operator based in Chatuchak, Bangkok Busline travels around major cities such as Bangkok, Chiang Mai, Surat Thani and Chiang Rai. There will be 5 trips with Bangkok Busline for those who choose to travel from Bangkok Bus Terminal (Mo Chit 2) to the Chiang Mai Bus Station (Arcade), with 4 return trips from Chiang Mai to Bangkok instead. If you choose to travel to other places between the two provinces mentioned, you can find them to be scheduled in the evenings because Bangkok Bus Line have received bigger demands for it to operate at that time. Bangkok Busline trips that go from Bangkok to Surat Thani in the southern province are only available in the evening for both ways. Besides having the accessibility of air-conditioning system on board the 32 and 24-seater buses with comfortable reclining seats, Bangkok Busline also installed a toilet for their passenger’s convenience. Make sure you choose to book your bus tickets early to avoid disappointment in selecting your preferred seating over the 2+1 configuration. If you choose to ride with the 24-seater VIP bus, you will get a travel pillow and a blanket during your trip, as well as some complimentary snacks for the road. You can even catch a few movies through the entertainment system, otherwise you can keep your devices charged with the USB port provided while you take a shut eye during the long-haul rides. Getting on the VIP Bangkok Bus Line will also have a food stop halfway at a VIP dining area with plenty of selection to choose from. Their drivers come with many years of experience in order to get you safely to your destination, so you can have one less worry because that is the last thing you would need to be concerned about when it comes to travelling. Try it out for yourself today! Just simply purchase your bus ticket here on Easybook website without having to leave the house. The other option is to download our mobile app to your devices to kickstart your travel plans with Bangkok Busline. 23/21 Soi Vibhavadi 13 Chatuchak, Bangkok 10900.